A hostel experience is a totally different thing than a stay in a hotel, a visit back home with your parents, or an expensive romantic getaway to an exotic island. Yes, hostels are just a little different and that’s what makes them fun. Below are a bunch of good things about staying in a hostel. 1. Hostels are full of some of the most interesting people you’ll meet on a journey. They are there because they are saving their money to travel so it’s inevitable you’ll meet up at some point and have a conversation. 2. You can cook your own food in a hostel, which means you can eat exactly what you like and you don’t have to fork out money for a big tip like you do in fancy US restaurants. 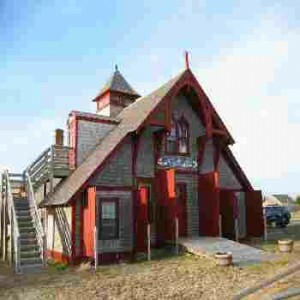 The Hosteling International hostel in Nantucket, MA. like to do fun things…once I stayed in a hostel in Phoenix, Arizona and I went out country line dancing with women from the Netherlands and Norway. Trying doing that when you’re in a Holiday Inn. 4. Conversations can be long, languid and even animated at a hostel. I have argued about the virtues of British automobiles, clashed with a Brazilian about his country’s attitude toward blacks, and spoke for many hours about poetry with a charming woman from Peru in various hostels. You just never know what will come up. 5. You have to clean up a little bit when you stay in a hostel. There are usually rules and some times you have to do a chore, like sweep up, or take out the garbage. This instills character and discipline, so just do the job and stop beefing, ok? 6. It never costs more than $50 to stay in a hostel, no matter where you are. I have stayed in Nantucket, on Martha’s Vineyard, and in many cities of Europe. Believe me, there are no hotels for less than $50 in any of these places…so I got used to the bunk bed and the lack of privacy. 7. If you want to know where a hostel is in the next city you’re heading for, it’s likely someone at the hostel will be able to tell you. Hostel travelers have been around the block, they know where stuff is. It’s like truck drivers…they are often the best people to ask if you need directions.